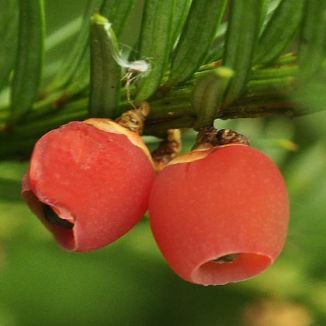 Yew is not easily confused with other wild plants on this web site. 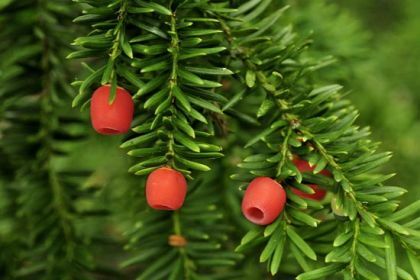 Evergreen tree or shrub renowned for its place in old churchyards, Yew can grow to over 20 metres high. Best known for its fruit, it is less well-known for its very small green-yellow flowers. The male and female flowers grow on separate trees, the male flowers bearing yellow pollen which they shed in February and March. The 'flower' in the picture below is a female. The fruit is a fleshy red cup-shaped berry which contains one extremely poisonous seed. In winter, these seeds are much loved by the Fieldfare and Redwing and pass unchanged through the guts of these birds. The tree bears lanceolate leaves spirally along it stems, the spirals twisted to align the leaves into two rows. The leaves are also very poisonous. The bark is red-brown and scaly and quite flaky. This is a native plant and it belongs to the Taxaceae family. I first recorded this tree at Timolin, Co Kildare in 2002 and photographed it there in 2008. Yew was planted in churchyards as a symbol of life, the evergreen endurance of the leaves seen as a symbol of the continuation of life. Some of the oldest trees in Europe are Taxus baccata and among these are some said to be over 2,000 years old.